I haven’t been to a mainland Chinese tea fair in quite a few years. Back in the day, I’d go when I get a chance, although in general, they’re all rather samey – a lot of big displays from big producers, plus a whole bunch of smaller stalls from smaller, no name sellers and producers that seem to exist on the sidelines just because. This year I got asked to give a talk at the 2018 Shenzhen Global Tea Fair, originally by Livio Zanini to be part of a panel. However, as that fell through, I figured… why not, I’ll go anyway, so I ended up going anyway to give a talk based on A Foreign Infusion. I got there early, before they formally opened, so I took a quick walk around before any customers showed up. 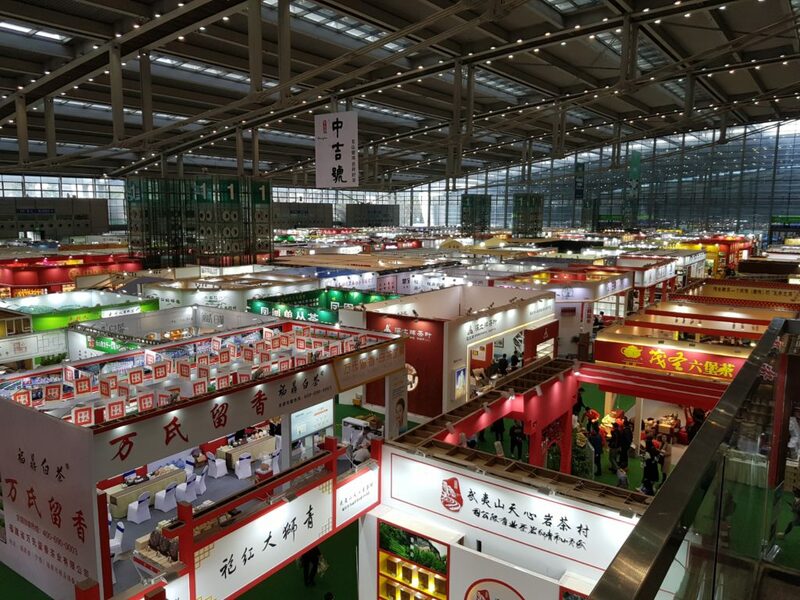 Tea fairs in China are part trade show, part consumer expos. For the bigger producers, I think it’s a branding exercise. For the smaller guys, it’s an important retail outlet. 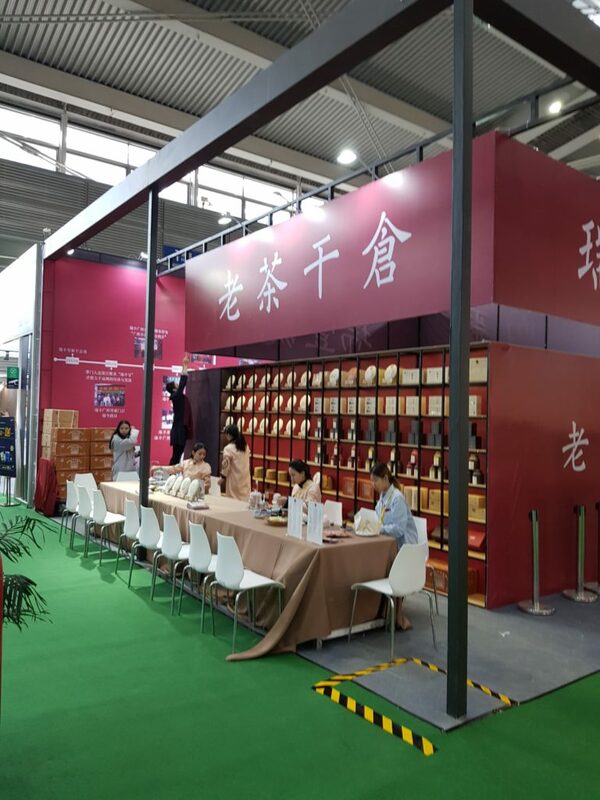 Last time I went to a Chinese tea expo, probably ten years ago or so, it was mostly puerh. These days, there’s a lot more white tea and liubao, although puerh is still quite important. Interesting to note though, some of the biggest brands in pu, like Dayi, don’t seem to be there – perhaps there’s no real reason to splash a bunch of money on what has to be a lavish stall (because they’re the biggest brand after all) and the return on such a stall is minimal, since everyone already knows who they are. Which are stalls that claim to sell “old tea, dry storage”, mostly pu from the 90s or 2000s, at pretty inflated prices and questionable quality. I can find cheaper or better elsewhere, no thanks. What the hell is “Tea York Hub” you ask? Well, the Chinese name makes more sense – “Haochacang” or “Good Tea Storage”. Basically, this is a rent-a-storage service. They’re not aiming to make money from selling you tea (although I think they dabble in that too) but they’re there to sell you tea lockers where you can store your tea in a climate controlled environment. Pretty brilliant, actually, capitalizing on people’s collections without taking on the risk of actually holding onto 1000 jians of Dayi 7542s. Dayi prices in recent days, for example, having been taking a bit of a dive. After I gave my talk I ended up doing a few more rounds and ended up trying out some aged oolongs at a few stalls. Whereas I have a lifetime supply of old Taiwan oolongs, aged Wuyi, good ones anyway, are much harder to come by. I did end up at a guy who had some decent 15 years old aged Wuyi, and I bought a couple small cans. He’s one of these smaller producers with a store in Shenzhen. Maybe I’ll talk about the tea another day. Well, he’s not wrong. My tea life these days is very simple – drink tea, usually in the office, and often the same kind of tea. There are a few go to favourites that I drink, but aside from that – not much else. I don’t buy new tea, generally speaking, because they’re both expensive and not that great. I drink stuff that are 10+ years old, usually. They sort of hit the right spot of reasonably priced and good tasting. I even bought some ten to twelve years old Dayi and they are very drinkable now. Don’t let anyone tell you 7542 is bad. A consequence of this is the blog has suffered. I don’t have much new to say, and I don’t really want to repeat myself all that much. What I think is already mostly said somewhere on this blog. It might require some digging (and thus my request for crowd sourcing some kind of archive – I’ll get to work on it, and thank you all for your feedback). But if one is patient enough to go through the older posts, especially stuff that were posted after I moved here from Xanga, then you will find the blog to be about as informative as it’s ever going to be. I suspect we all reach a point like this. Unless I’m posting endless reviews or some such, there is only so much to say. So, bottled teas are, of course, everywhere these days. Most of the time, they’re some cheap, crappy tea in a PET bottle. In a pinch, it’s good for a caffeine fix. That’s about it. I saw this at a local fancy supermarket. It’s in a wine bottle. It’s tea. You can read the description yourself. 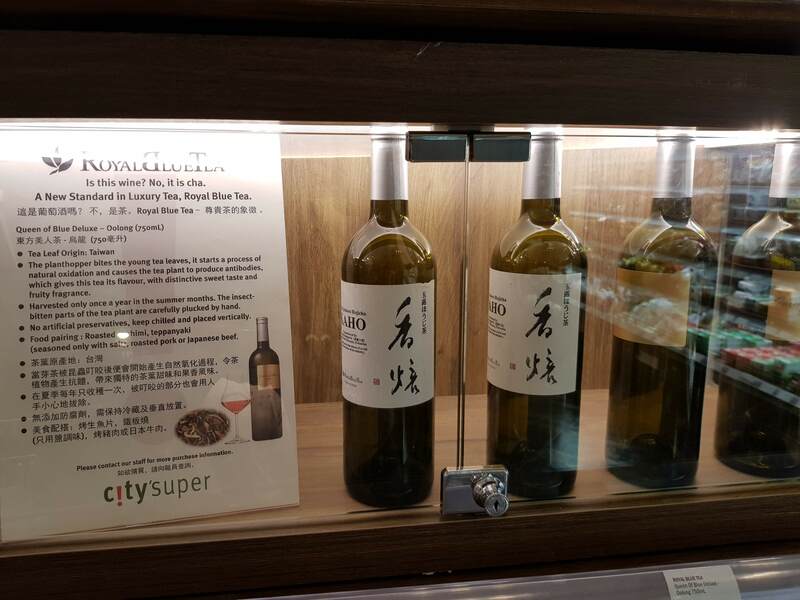 What I didn’t shoot was the price – one bottle of this “Queen of Blue Deluxe” is $800 HKD, roughly $100 USD, and you thought your $2.49 bottled green tea was expensive. This company exists on the web. It’s Japanese, unsurprisingly. The tea “Queen of Blue Deluxe” also exists on their site, for about 4500 yen, which is like $40 USD. Quite a markup to sell at $100 instead, of course, but they do have to pay Hong Kong rent, shipping, etc. Supposedly, the tea was extracted over the course of seven days in a kind of cold brew. Pro tip: you can probably do this at home in a fridge, for a lot less than $100 a bottle. If anyone wants to buy me one to try it, I’d be happy to give it a whirl. But at these prices, I’d rather buy this. So, one reason the blog isn’t nearly as active as before is because I don’t have a lot of new things to say. I feel like a lot of stuff that I need to say, I have already said (sometimes multiple times) somewhere on this blog. However, the way this blog is currently organized is not very conducive to reading older posts. You can scroll chronologically, but that would include a lot of drivel with the more interesting posts. Some people have told me they have gone back and read everything, but even then, keeping track of stuff is hard. You can try the various tags I used, but I have kept those fairly general, so they’re not super useful (probably an understatement). Thus I am writing here to ask for your help – if there’s something I’ve written in the past that you believe is interesting/useful/changed your ideas about tea, then I would love for you to tell me via a comment below (preferably with a link to the post itself). I’m going to try to collate them into an “archive” of sorts with individual links to posts on a separate page, so that people visiting this blog for the first time have somewhere to go to read the more interesting things. I see traffic statistics on posts, so I have some idea what are the ones people get linked to, but more traffic doesn’t mean better, especially since more clicks makes no difference for me given that there are no ads. So, tell me what you want to see in this “archive” of posts. I’ll try to keep it short-ish – maybe an upper limit of 20-30 posts in the past. We shall see, and thanks in advance for your suggestions. Back in the day, farmers in Taiwan all produced their own tea – up to the point where the tea is dried and technically drinkable. The teas would then be sold to tea buyers whose job was to go to the villages and gather these teas. They would then sell the teas to wholesalers in places like Taipei, who would then blend, further process (mostly roasting), package, then sold either locally or, more likely, overseas. Then, Taiwan’s economy changed, and with it the target market for their teas. While it was exporting to places like Japan, Taiwan was also consuming increasing amounts of their own tea. In fact, by the 1980s a majority of Taiwan’s teas were locally consumed, and now they’re actually quite significant importers of tea from other Asian countries, because the overall demand for tea is no longer satisfied by locally produced teas. At the same time, things changed internally as well. For one, transportation is easier. Nowadays, for example, driving up to the tea mountains is just a weekend trip, whereas back then, going up takes real effort. If you have a car and you just want a weekend trip, well, the tea mountains are right there. Farmers started selling direct to consumers, instead of just to wholesalers. The old middleman stratum of traders no longer exist – wholesalers in big cities tend to buy direct from farmers, and farmers often sell to consumers directly as well, acting as retail as well as producer. Blending is no longer nearly as important as it used to be, replaced by individualized productions done by farmers or substitute processors – people who are paid by the kilo to do processing for other farmers. That tea you buy from farmer X directly is quite likely produced by processor Y (while farmer X works on his own competition tea, but that’s another topic). Some consumers like this, because they feel like they’re buying direct from the farmer and so the tea is somehow more “authentic”. 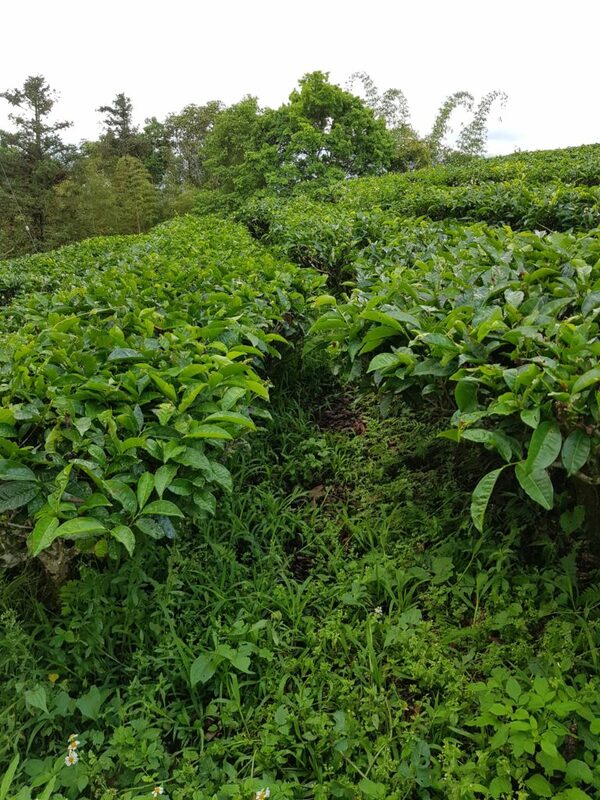 Even though often times these more entrepreneurial farmers who also retail tend to not only sell their own teas, but also teas of their friends – to provide enough variety for the consumer to buy from. Still, it’s an attractive model. One of these guys that you might have encountered before is TeaHome, which has been active online for years now. You may have seen their oolongs on eBay, for example. I buy from them from time to time for very dependable teas – prices are reasonable and quality is decent. I’ve visited them before on a previous trip – the owner is an interesting guy with no background in tea prior to entering the business some 10+ years ago. He said he was a civil servant but due to one reason or another decided to become an organic tea farmer. He’s doing fairly well, as far as I can tell. Another tea farmer I visited this trip that is also doing direct sales now has their own little brand called “Xin Cha Nong”, with an interesting url of teaez.com. Their family story is quite typical – two generations of tea farmers now. The dad (you can see his picture on the site) entered the tea business from farming other stuff because tea was far more profitable in the early 80s for farmers in the Dong Ding area – so like a lot of people he learned how to make tea and has been doing it ever since. 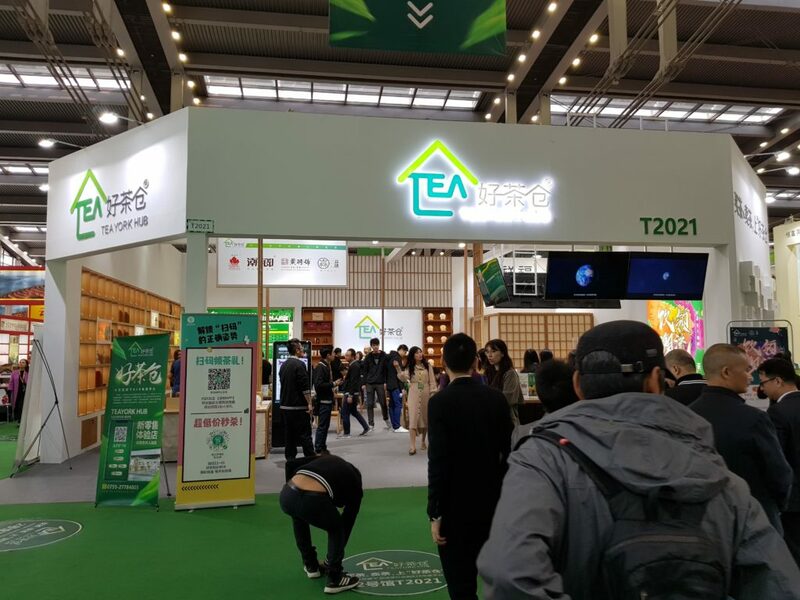 The younger generation in the family is going to inherit the tea business, but are also branching out and are responsible for the sales/website part of the business. Learning how to do all that, while mastering these new skills, is part and parcel of how these tea farming families can stay alive. Despite this though, there are a lot of upcoming problems that everyone is aware of. There is the typical East Asian problem of aging rural communities – young people generally don’t want to stay in the villages, and would prefer working in some higher prestige jobs in the cities instead. There are plenty of farmers with no one interested in taking over. Because of the downward pressure in prices for tea, lower elevation teas are becoming less lucrative, and many farmers have instead switched to farming other things – fruits, for example, which pay more and involve less work. There’s also labour issues – finding enough people to pick teas by hand is getting more and more difficult. These days almost all tea pickers during harvest season are foreigners from places like Vietnam and Burma. Give it another ten years, and many farmers have told me that they think they would have to figure out some way to make decent tea with machine harvest, because there will not be enough people to pick teas anymore. It’s a real crisis. There’s no real telling how things will develop from here on out. Tea farms will surely still exist in Taiwan, as there are some young people willing to take up the mantle and others join in. The question is – what will that tea industry look like, and what kind of products are going to come out of it? That’s a much harder question to answer, and all we can do at this point is speculate. Every tea farmer’s association in Taiwan holds competition. Some of these are huge – the Lugu one, for example, attracts over 6,000 samples per competition (twice a year). Smaller ones get hundreds or a thousand entry. Every member of the association could enter a certain number of samples (often 10) per competition. Then, they are judged in groups with a panel of judges tasting them quickly and eliminating ones that are not good enough. Finally, there’s one “Special Prize”, which is the top prize, a tier of “First Prize” (number of which depends on the size of the competition), “Second Prize” and “Third Prize”, and also “Three Plum Blossom” and “Two Plum Blossom” for the competitions that have these grades. For Lugu, for example, you send in 22 jin of tea. 1 jin is used during the competition – tasting, etc. 1 jin is basically payment to the farmers association. The rest, the 20 jin, is tea that you’ll get back whether you win or lose. If you win, they get packed in the competition packaging of the right class. A “Special Prize” will sell for something like $3,000 USD a jin. The others are a lot lower in comparison, but still represent a markup compared to normal tea prices. So, entering and winning is good money. The competitions are also there to reward skills. They began during the colonial period as a way for the government to encourage better quality production – to publicize people who made good tea, and to get farmers to strive for higher quality product. This purpose continued after Taiwan was returned to China in 1945. These days, it’s less of a quality issue and more of a marketing scheme, but there’s still an element of rewarding skill that’s involved – if you win the higher grade prizes, for example, you’ll get a plaque that goes with it saying what year, what competition, and what prize you got. A farmer who can hang a bunch of them in their shop (or, as is sometimes the case, has so many that they start stacking them up against the wall) can claim to be a better tea maker than others and sell their teas for more. Two young punks? Yes. 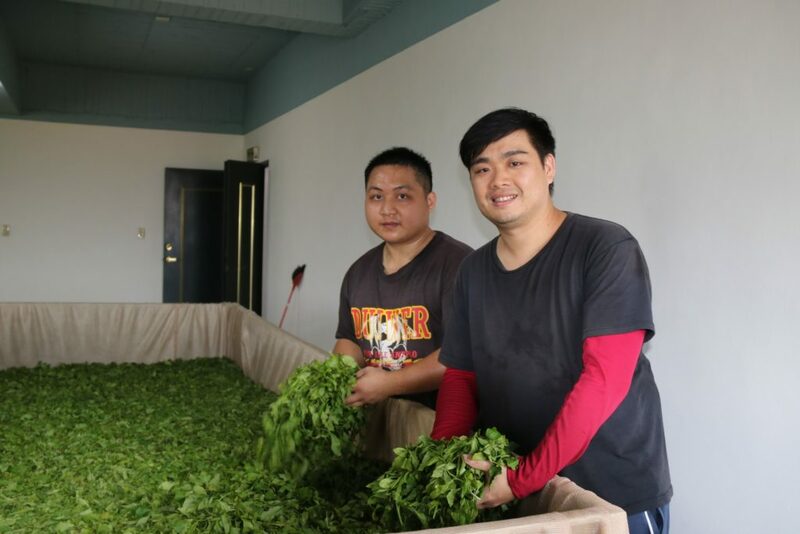 Well, the guy on the right is called Zhuang Rongpu and is barely 30 years old, and he’s been in the tea production business for five years. His dad was a mushroom farmer, but he wanted to be a tea producer. So his dad helped him set up a brand new factory, which I visited on my trip this time. He’s won a number of “Special Prizes” in the last five years – at least one a year, from what I gathered. Considering that there are producers who never win one in their entire career, this is pretty remarkable. Granted, he’s not in a hyper-competitive area like Lugu – he’s in Yuchi, a black tea production area. In terms of production procedures, black tea is really quite simple – withering, rolling, oxidation, drying. That’s it. As the local farmer association secretary said to us, “you can make it too”. He’s not wrong. We could. It won’t taste good, but we could. If you ask a tea farmer/producer how to do something, they can tell you in great detail. They’re also often willing to tell you too – there really aren’t any secrets, so to speak. The devil is really in the details, and with something as simple as black tea, it is no exception. When we visited, for example, they just harvested some new leaves and were withering it. The tea is just sitting there on a bed with air blowing underneath, and it’ll sit there for almost a full day. Unlike oolong, there’s no need to disturb it – in fact, you shouldn’t disturb it. The real trick, of course, is how to manage this – how much leaves to put on? How long do you wilt it for? When is the right time to move them to the roller? How long do you roll them for? At what speed? When do you stop the rolling and re-wrap the tea to roll again? How much longer? When do you stop rolling all together and move to oxidation? How long do you oxidize it for? All of these have a simple answer – “depends”. They can give you ballpark figures, but precisely when is dependent on so many variables, it’s impossible to say with any kind of certainty. For example, in the trough above, they didn’t fill it to capacity – it is designed for a maximum 150 jin of raw leaves, but they only filled it about half full, because it’s easier to control the withering process. Since they had room anyway, they spread the leaves out on multiple troughs. It’s the tea producer’s job to assess when the tea is done withering and move on – and there’s no real objective measure that you can use to tell when that is. There’s no machine, at least not yet, that can replicate a human touch for these determination. So, our man here decides when it goes downstairs to the rollers. And his judgement at multiple steps along the way determine the quality of the final product. Of course, this isn’t just about the producer – with bad leaves no matter how good a producer you are, the tea is still going to come out inferior. Farm management is also crucial. These guys don’t own any farms – they contract with farmers whose job is to grow the tea trees. They work together on a plan for managing the plants, and to make sure they get what they need as raw materials. It’s a collaborative process. They’ve obviously got something good going. Still, this is a producer with five years experience and no family history of tea making. It doesn’t sound like he should be making great tea, but he obviously is. While skill is something that accumulates over time as you get more practiced at doing something, there is also another factor – talent. Mr. Zhuang clearly has it in spades. I spent the past three days in central Taiwan doing fieldwork visiting tea farms and such. Once you’ve seen a few tea farms, they all start to blend in – farms on their own are not particularly interesting unless the farmer is doing something really interesting, or there is something weird about the farm. Likewise for tea production facilities – the machines are mostly the same, the processes similar, and the only real difference lies in things you can’t see – the producer’s skill, timing, weather, leaf conditions, that sort of thing. This is one of the five tea research stations of Taiwan, official units of research into all things tea – from developing new tea varietals, to cultivation techniques, to production improvements. This place isn’t open for public – you need to have a valid reason to request a visit in advance. The tea station is quite large – they only use about 10% of the land they have because they don’t really have enough manpower to use any more. 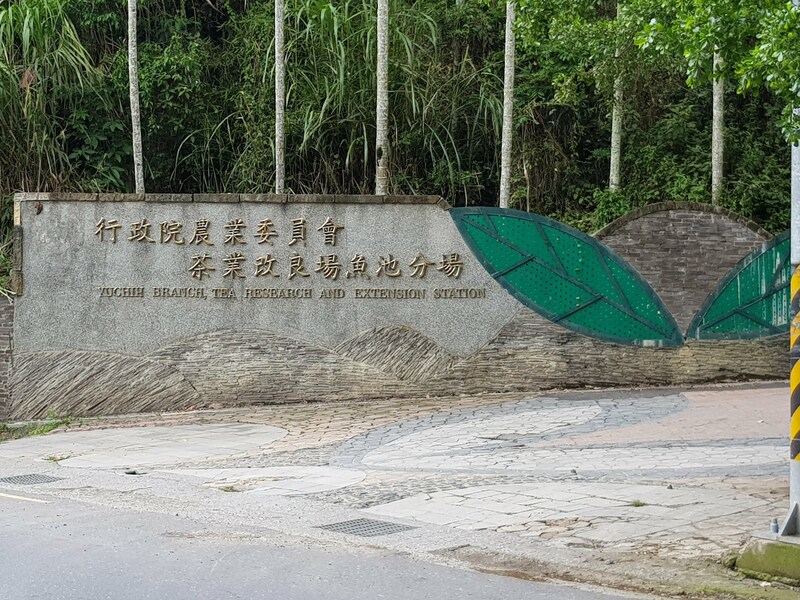 This is the place that developed Taiwan tea #8, #18, and #21 – the station was originally set up in the Japanese colonial period for developing technologies related to cultivation of assamica varietal imported to Taiwan. #8, #18, and #21 are all black tea varietals, with the #18 being the most popular these days for a variety of reasons. The station is quite interesting – they don’t use any pesticides and herbicides, and only organic fertilizers from what I understand. The point, after all, is to test the plants’ abilities to withstand various growing conditions and select the strongest trees for selective breeding. Using pesticides and such will mask their weakness. In the above picture you see how there are lots of random plants growing under the trees – that’s what a farm that uses no herbicides look like. In most pictures of tea farms you’ll see the soil around the tea trees are barren and brown. Likewise, the leaves are full of marks of insect damage. This is of course because they don’t spray pesticides. They do use something called “tobacco water” – a natural concoction with an infusion of tobacco (leftover bits from the cigarette industry). The nicotine helps repel insects a little, but only lasts a couple weeks and spraying is a lot of work. Most farms wouldn’t use it, but they do because it helps control the insects somewhat without any chemical pesticides. They also do all kinds of tests with production methods. This is necessary because for each varietal of tea the processing may be different – a certain tea may come out better with longer oxidation cycles, or needs slightly less time during withering, or so on. 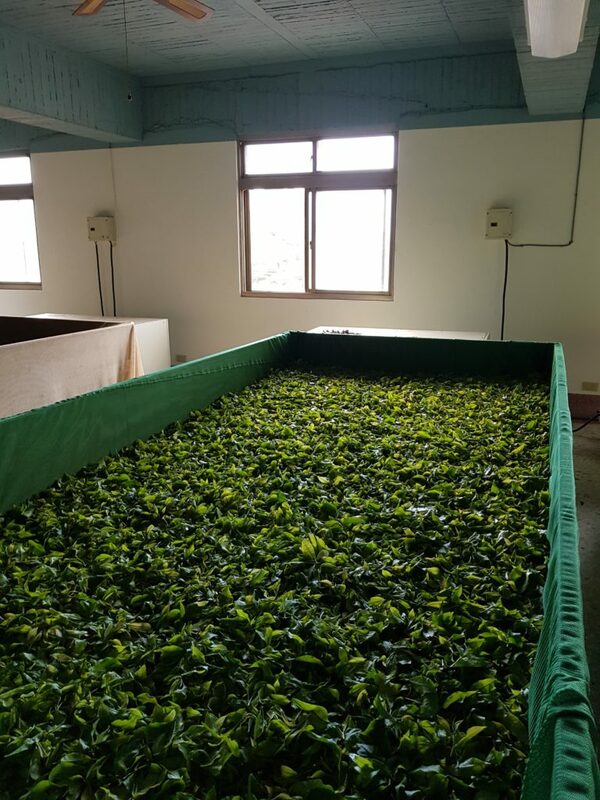 The Tea Research Station might not know what is the best method of making a certain tea – after all, that is dependent on a lot of factors – but they certainly do try to figure out new ways of production that will help farmers along. Different varietals also have different growing characteristics that changes production methods. #21, for example, has buds that will grow too old quite quickly, so the harvest window is relatively short. If it happens to be raining on those days, then a farmer may be forced to harvest in sub-optimal weather (normally, nothing is done during harvest on a rainy day). Those teas will be inferior. For someone who has a smaller field who wants a tea that is easier to work with, #18 is preferable. They also offer classes – introductory, intermediate, and advanced ones on tea making skills. Unfortunately, sons and daughters of families of tea farmers have priority, and leftover spots (if there are any at all) are filled by people in the tea industry. Younger people in the tea making business I talk to generally have done some of these courses at some point – they learn the basics and use those skills at home when they help out. In many ways, this is probably their most important active service to the tea production community, even though it may be underappreciated. As one of my colleagues said, this is the “Tea Geek Paradise.” It was very interesting visiting and talking to the staff there, surrounded by tea trees while geeking out about tea history. 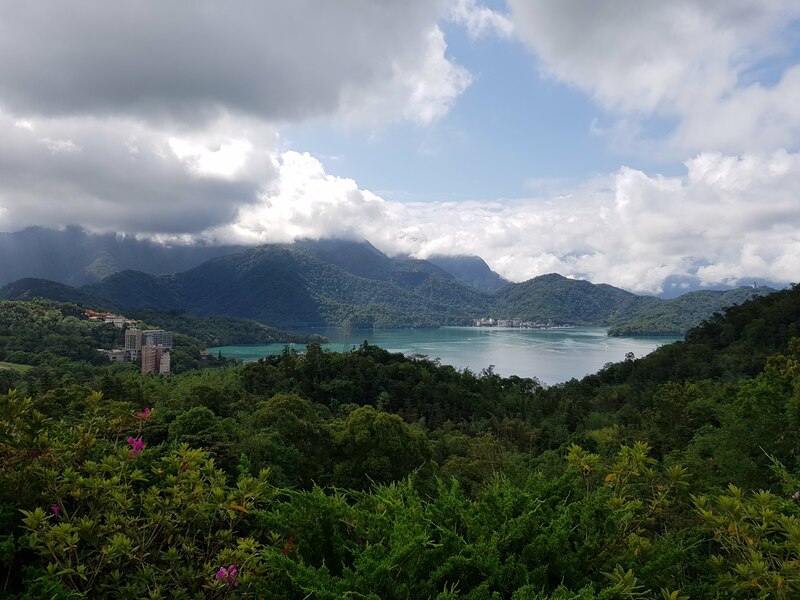 Doesn’t hurt that they have an amazing view of the Sun Moon Lake as well. When you’re here to eat dim sum, the first thing that happens is you sit down, and they ask you what tea you want. Usually, your choices are as follows: shoumei, shuixian, puerh, jasmine. Some places offer some low grade tieguanyin instead of shuixian, but those are your basic choices. So I was with some friends and we went to this place we’ve never been. Instead of actually getting a choice, they just plopped down some jasmine for us – which was very unusual. I think it was because we were chatting in English before sitting down, so I guess the staff figured we didn’t speak Cantonese and wanted to avoid dealing with us. So I asked for some puerh instead. They quickly swapped the teapots and gave us what looked like puerh. So far, so good. Except when I tried to drink it, it tasted really, really weird. At first I thought it’s a bad tea – some restaurants use really cheap, bad tea to save on money (even though they charge you $2 USD per person for the tea). Then, after a couple sips, it really became obvious something was really wrong. We mostly avoided the tea from that point on, and near the end of the meal, I pulled out the leaves. It’s pretty clear here that something weird is happening. Some of the leaves are the typical puerh leaves – dark, wiry, somewhat stiff. The rest however are something different. The green stuff – what was it? 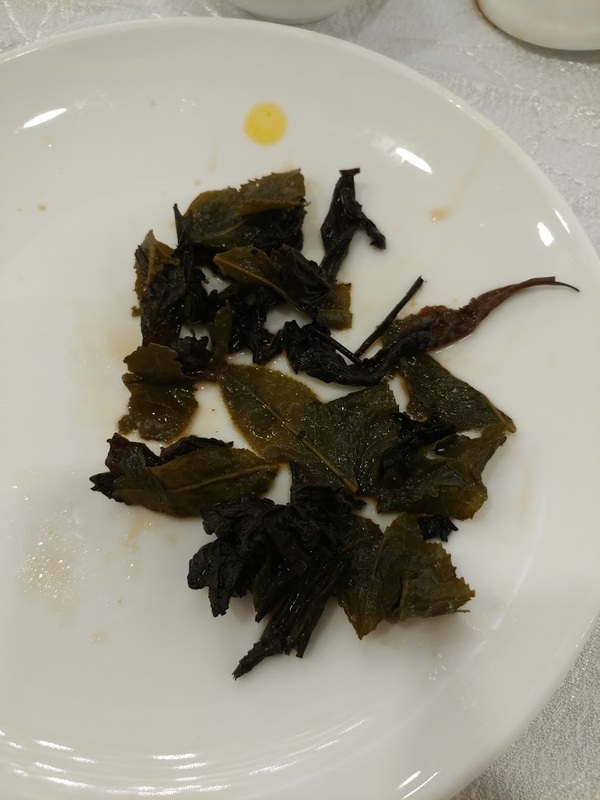 I took a look, and it seemed like the tea is some kind of really low grade tieguanyin or something similar. The question is – why would anyone do that? I have two theories, but neither are very satisfying. The first is simple – they made a mistake. That seems highly unlikely, because one look at the leaves and you’ll know it’s off. Of course, maybe they mixed it by accident and simply don’t care – it’s possible. The other is that this is some really misguided idea of blending the teas thinking that this is a good idea – that the tieguanyin will help raise the aroma of the tea, while the puerh gives it body and bass. Well…. that simply didn’t work in this case. It was really, really weird tasting. These days I’m not doing much buying – there’s just no good reason to. Part of it, of course, is the slow realization that I no longer need anything. There’s only so much tea one can consume – assuming 10g a day, you’re talking 3.6kg a year, which isn’t that much more than 1.5 tongs of tea, roughly. That’s 15 tongs for ten years, or 60 tongs for basically 40 years. You really don’t need that much. Of course, this is coming from someone who already has a lifetime supply of tea, so I suppose it can come across as one of those posts where someone rich is telling others to live simply. However, looking back, I think there’s something to be said about buying less but buying better, for the simple reason that the crap, the stuff that isn’t very good, will never be revisited. If you’re buying and storing puerh, and are holding onto that cheap tong of whatever that you picked up hoping that it’ll turn into something better, chances are it’s not going to happen – it will stay terrible, and you’ll never drink it, and ten years from now you wonder why it’s still there because it’s still bad and you have other better teas to drink. I know I’ve talked about hitting hard with a hammer, but there’s a big caveat with that – you only do that when you know something is good and something you’d want to drink. Having a whole bunch of stuff that you hope will turn into something you may want to drink years from now is a terrible proposition – and will usually end up with just wasted space. There are warehouses full of crap in places like Guangzhou. Those will eventually have to come to the market. The price for old but mediocre tea will never go up much, even if it’s old. Getting rid of the tea also presents a problem – I have no idea what to do with the tea that I don’t really want. If it’s something I wouldn’t want to drink, chances are I wouldn’t want to sell it – because it feels wrong to sell off tea that I know is no good. Tea also costs money to ship, which is not great. What exactly does one do with unwanted tea? Compost? It’s a problem and there isn’t even really a good solution. The same logic can apply to teaware, which, of course, I also happen to be sitting on a lot of. My normal rotation of yixing pots, for example, consists of only about half a dozen pots. The rest of them just sit there to look pretty. It’s fun collecting, and I enjoy every piece. However… there comes a point when you have too many. I probably long crossed that line, so these days, only stuff that is really special are worth collecting. Otherwise….. forget it. So, when choosing something to buy, buy less, but buy better. Better, of course, is the hard part. But eventually that will pay off in the long term. Restaurant tea service is often bad, I think mostly because it’s difficult to get right. Of all the things that a server needs to do, making tea to serve a customer is probably one of the most time consuming. You have to gather at least 3 pieces of wares, put leaves into the pot, add hot water, then bring it over and pour it out for the customer plus all that cream and sugar business. Compared to coffee, where you really only need one cup for the coffee and usually only a button press for the actual liquid, it’s a lot of work. Moreover, there are other hidden problems in tea service. Like yesterday morning when I drank this cup – the tea was supposed to be English breakfast, but the problem is the little metal pot they used had been brewing quite a bit of peppermint tea, it seems – my English breakfast tasted like peppermint English breakfast, which was, well, kinda gross. 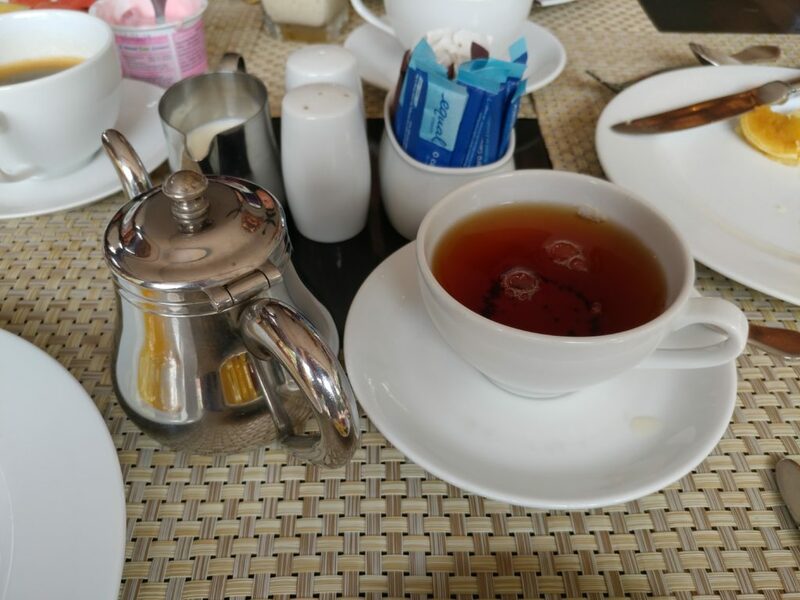 I’ve always bemoaned the poor state of affairs in most tea service at restaurants, but as I have family in the F&B business, I have also come to appreciate exactly how much trouble it is to offer good tea in a restaurant setting. You can’t charge too much (certainly not more than a cup of specialized coffee) and you have to try to make it quick – all the while trying to offer something serviceable, and most of your clientele don’t really care. There’s a good reason why so much tea service is so mediocre. Nobody is really willing to pay for the good stuff.